While fleeing from authorities is never a good idea, it's especially a bad idea to leave your car while it's still running — because it could hit you. One car prowler learned that lesson the hard way, according to the Clackamas County Sheriff's Office. On Monday around 11 p.m., deputies with the Happy Valley Police Department responded to a call of a theft in progress in the 11000 block of Southeast Cedar Way in Happy Valley. The caller said a man tried to open her mom's car before walking to her neighbor's home and stealing items out of another car. Once deputies arrived, they spotted a black Honda Accord parked in the 11300 block of Southeast Cedar Way. They noticed a large pile of belongings in the back seat and scattered throughout the car, which led them to believe it was the suspect vehicle. The suspect — 31-year-old Isaiah John Gellatly of Vancouver — was lying in the reclined driver's seat. However, as a deputy shone his light in the car, deputies said Gellatly quickly sat upright and sped away. Despite spike strips puncturing his tires, the suspect continued to speed away from authorities — blowing through stop signs and crossing into the opposite lane of traffic. Deputies said Gellatly eventually started to have problems controlling the car, hitting curbs, retaining walls and the bumper of a pursuing patrol car before he turned the chase into a business complex at 101st and Sunnyside. So, Gellatly jumped out of the driver's-side door and started running without putting his car into park, according to officials. He was running along his own rolling car when he attempted to cut in front of it — around the same time it crashed into a tree and building. The crash pinned Gellatly's lower leg under the Honda's tire, which was completely deflated by that point. Deputies subdued him and used a car jack to lift the car off of his leg. He was taken to a nearby hospital with a broken leg. Authorities found numerous items inside the car that are believed to be stolen, including a tennis racket, a ping-pong paddle, Texas Instruments calculator, designer sunglasses and a Schwinn scooter. Two victims have since been reunited with their stolen items. Once Gellatly is released from the hospital, he will be taken to the Clackamas County Jail and booked. Some of the charges he'll likely face include attempt to elude, reckless driving, unlawful entry into a motor vehicle and second-degree theft. Gellatly is well-known to authorities. 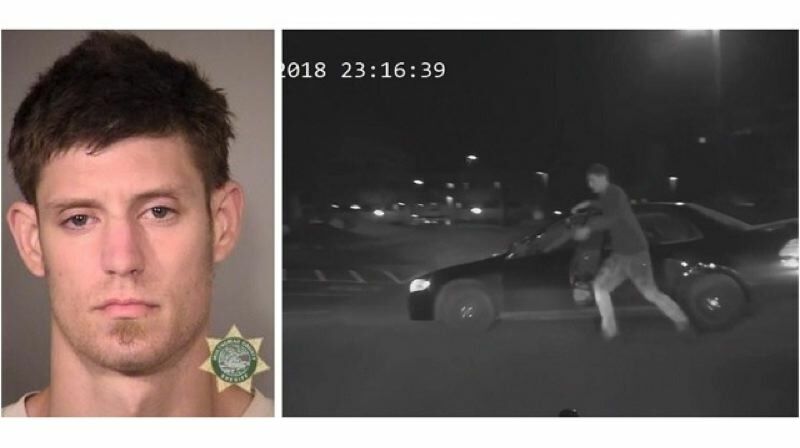 In September 2016, Portland police arrested him on charges of stealing a car from the Mousetrap Tavern with the owner's 8-year-old black lab inside.